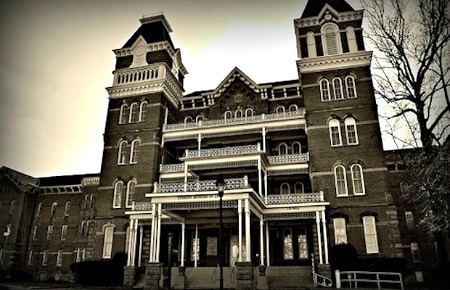 Is Athens Lunatic Asylum Haunted? the Athens Asylum for the Insane, the Athens State Hospital, the Southeastern Ohio Mental Health Center, the Athens Mental Health Center, the Athens Mental Health and Mental Retardation Center, the Athens Mental Health and Developmental Center, and then once again the Athens Mental Health Centre. Taking just over 7 years to build following the plans of architect Levi Scofield, the asylum started off as being almost completely self sufficient, boasting facilities such as farming fields, livestock, green houses and an orchard. At its peak the asylum was Ohios largest employer, and during the 1950s the hospital covered well over 1,000 acres, and was operating across 78 buildings which could accommodate 1800 patients. Since the site was so big most of the work carried out on its maintenance and farming land had to be carried out by the patients themselves, which was officially recorded as being part of their treatment but in reality was just a way to keep the hospital open without having enormous upkeep costs. The hospital continued to operate until 1993 when it was officially closed down, however the institution of the state hospital continued to function in Athens but all staff and patients were relocated to other modern facilities. Today most of the buildings remain on the site but have been converted to accomadate various other functions, including classrooms, offices and even an art museum. As I am sure you are aware, early treatment at such facilities was primitive and highly experimental to say the least. With different asylums coming up with their own versions of what caused mental illness and they all seem to have had their own methods of treatment. One of the most common theories at the time was that mental illness was caused by infection and the best treatment for this was to removed the infected part, which was often the teeth. Athens lunatic asylum was no stranger to the odd bit of teeth pulling, but they just so happened to have their own very strange theories and treatments. The Athens lunatic asylum annual report of 1876 claimed that the leading cause of mental illness was masturbation, with the second most common cause being that of intemperance and dissipation. This may sound quite silly today but this was widely accepted as being a genuine cause of mental illness at the time. In the first 3 years of its opening, 81 men and 1 woman were diagnosed as having their insanity caused by masturbation, and 56 men and 1 woman having their insanity caused by intemperance and dissipation. As for the actual hauntings here it seems that there is no particular hotspot in the hospital, though the old treatment rooms seem to have a slightly higher number of encounters in them than the rest of the grounds. Perhaps this is due to the barbaric treatments that were carried out within those walls, such as hydrotherapy, electric shock, lobotomy's, and the administration of psychotropic drugs. Needless to say there were a good number of deaths at the hospital and it seems those who died of their "treatment" are to angry or upset to move on. One of the most common stories about the hospitals hauntings is the ghostly stain left by one of the patients who died here which is pictured above. The story goes that a patient named Margaret Schilling disappeared from one the ward on December 1st, 1978. Several weeks later her body was found in one of the rooms of ward 20 which was an area of the hospital which had been closed down for years. The official cause of death was recorded as heart failure, but the odd thing about her death is that before she died she had taken off all her cloths and folded them neatly beside her. Also its thought she was hiding up there as part of a game she was playing with some of the hospital staff, but the odd thing about this version of the story is that the door to the room she was in was locked, and if she could not get out then why did she make no attempt at shouting out a window to staff who could have easily heard her. 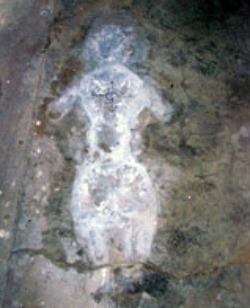 Today she is thought to be responsible for some of the paranormal activity that goes on around the main hospital building, and on top of this the stain her corpse left has not been able to be removed by any amount of scrubbing. Apparitions have been seen within the old hospital corridors and shadowy figures seem to be common around the old treatment rooms. But the most commonly reported encounter within the grounds is the feeling of someone standing right behind you, as if they were almost about to bump into you from behind, which has scared many visitors who have turned to see who was getting so close only to be surprised to see no one there. Orbs can also be captured across the whole of the grounds with some being especially brightly colored or much larger than normal. If you wish to visit the site of the old Athens Lunatic asylum then please check who owns the part you wish to visit and get the necessary permission, as since the grounds were so large, over 1000 acres, the buildings have been changed into a number of different things and are owned by various companies.